Register for our free newsletter and get the latest news about our special events. The smart way to supplement classroom curriculum! FACT: Nothing stimulates elementary school learning like field trips that expose students to new ideas. PROBLEM: Finding quality, affordable field trip destinations that meet New Jersey’s Core Curriculum Content Standards — particularly for the all-important Literacy and Character Education programs — can be a challenge. SOLUTION: EduQuest! The accredited, interactive educational experience for youngsters at The Funplex in East Hanover! EduQuest transforms the popular MagiQuest attraction at The Funplex to “The Character Education Academy at MagiQuest.” This magical, interactive setting is the perfect environment for performance-based lessons in collaboration, creativity, responsibility, literacy, fairness and citizenship. Developed by teachers, for teachers, it’s the perfect field trip destination! 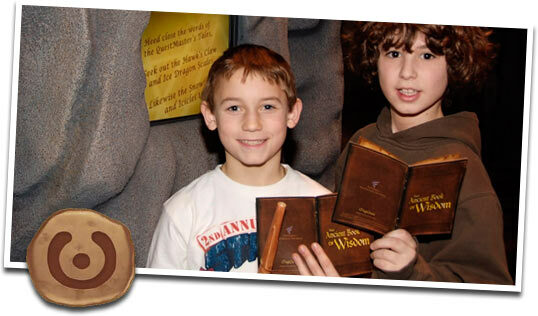 MagiQuest creates a positive and engaging fantasy realm where youngsters encounter numerous learning experiences. Students take wands containing motion sensors which activate flat screens and other devices in trees, mountains and other parts of the realm. The “Quests” players engage in are ideally suited to educational missions, as students search for clues and solve problems during their journeys. For more information, contact Kim Williams at 973 428-8772. Class members implement character and teamwork traits in a group setting. Students identify and describe character traits such as collaboration, cooperation, and creativity, and to implement these traits in a group setting.